I have to admit that I asked to review this book because I thought it would have some information on making walking sticks, the kind used for hiking - you know what I mean, six feet long, suitable for reaching and either encouraging my hiking companion ( an Alaskan Malamute) to stay with me or discouraging her from confronting other canine hikers! Well, I didn't quite find this book to be just what I was looking for, but fascinating it was. The authors title this book as a complete course, and it is. The "sticks" they are making though are more what I would call a cane. Yes, it is a walking stick, but a more "civilized" walking stick than what I had originally pictured in my mind. The shepherd's crooks were probably the only sticks that came close to "my" original educational wish. The first chapter in this course describes how to find, cut and season the wood needed to make a walking stick. Just reading this chapter makes a walk through the woods an education. Now I can walk and watch for a particular shape of a branch that would lend itself to stick making, or watch for a particular kind of tree or bush that will lend itself to this craft. What really fascinated me though was the idea of growing the right piece of wood for this craft. This is not the kind of craft where you only need to get a few tools, study a few plans and/or pictures and start immediately producing these works of art. Patience, patience, patience and then some more patience is needed. Once you have acquired the right piece of wood, you then have to wait for it to season properly; this process alone can take from one to two years. All of this work and waiting and you still only have a branch, but finally you can start to work with it. The authors have described in detail how to strip the bark when needed and how to straighten the wood if needed. Successive chapters lead you from making a very simple walking stick (thumbstick) up through making complexly carved handles of horn which are then attached to the stick. All of these are truly works of art. 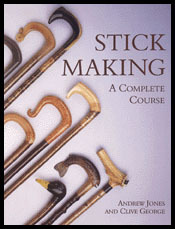 The complete novice should be able to take this book and teach him/her self the craft of stick making. Individuals with more experience in the craft can go directly to a particular chapter to learn the part of the craft needed to expand their skills. For a carver this book offers a huge number of ideas for practical uses of their craft. The last chapter is entitled a "Medley of sticks". After finishing with the basic instructions for this craft, the authors have offered up some very specific tips and techniques for the more advanced stick maker. In addition, there is a very extensive gallery of pictures of different walking sticks. Truly there is something for everyone here, particularly a complete novice like myself! In spite of the fact that this book does not instruct in the type of walking stick I originally had in mind, There is enough information here that I think I could transfer a lot of the knowledge into making what "I" had in mind. And don't we all approach a book the same way. By looking at the title we get an idea in our own head of what the book is about. Although initially disappointed that this book was not what "I" had in mind, I found it fascinating. I still hike through the woods with my canine companion, but now I have a purpose in looking for the right stick for me to try this craft! Post Script: I just received the 1999 catalog from Treeline: 1-800-598-2743. My review stated that you needed a lot of patience to find the correct kind of wood for stick making, and then to wait until it had dried sufficiently to be able to use. If you are as impatient as I am, you will be glad to know that Treeline now carries a selection of walking sticks in two lengths: 36" and 55" to 60"; and two widths: Large 2"-3" in diameter, and Small 1" - 2" in diameter. You also have several choices of wood: Saguaro Cactus, Ocotillo Cactus, Salt Cedar, and Diamond Willow. Their prices seemed reasonable to me considering how much "TIME" is saved. They also carry a variety of Horn suitable for carving handles etc., so you can get all of your materials from one place. I have no affiliation with Treeline, other than as a customer. I hope this information will be useful to those of you who were intrigued with the idea of making walking sticks. Editor's Note: Pat is the webmaster for Scrollsaw Assocition of the World (SAW).